A pretty decent film noir until it takes a turn for the ridiculous at the end and nearly sacrifices everything that came before it. 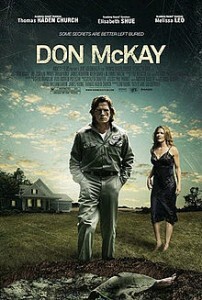 Don McKay is a strange movie. First off, it’s basic plot covers familiar ground, which is a pretty bold move in today’s day and age, where we’ve seen things a thousand times before. but it does it in an artistic and even creative way. it’s the kind of movie that says, “we know you’ve seen this sort of thing before, and it works, so we’re gonna give you a movie that fits the same formula, but we’re gonna add to it and put our own spins on it and see if we can throw you for a few curve balls.” and it does. the premise is that a guy comes back to town, shacks up with an ex-girlfriend, (sonny), and ends up killing the man she’s with now. that’s the formulaic part, anyway. he now spends the rest of the movie hiding and covering the body. every bit of that has been done before, from unfaithful to shallow grave. but here come the twists…for starters, he only came back to town because the girl sent him a letter telling him that she was sick and dying and wanted to see him again. secondly, he didn’t know this was the man she was seeing, because instead the man was introduced as her doctor. and even after killing him, it is still not revealed for a while exactly who this man is and what his relationship was to sonny (elizabeth shue). don is our hero, or anti-hero, played by the very funny thomas hayden church, and he is an absolute everyman, lonely and horny and uncertain of exactly what’s going on around him. the movie has a lot of that small town feel to it, where there are only a handful of characters and they seem to appear again and again. the local cab driver, for example, is always the same old man and he picks don up and drops him off every time don comes in or out from the train station. i liked that community of characters situation and thought the movie could have used even more of it. maybe a few scenes where don went to the local store and every time he went, saw the same clerk and flirted with her or something. i liked the usual locals in groundhog day and hot tub time machine and any other movie that takes place in the same small town for the entire length of the film. of course, those two movies were both sort of spins on the time travel situation and this one is not. instead, it has it’s own things going on, although we don’t really become aware of them until the end. So it’s early in the film when don kills the good doctor, played by james rebhorn. then don hides the body in the backyard. he calls up his friend from back when he used to live in this town (the always funny keith david), and together they go out to the yard to dispose of the body. only the body is not there anymore. i guess that shouldn’t be much of a surprise to anyone. now we have our first mystery, which is what happened to the body. another one comes when sonny gets off the phone with someone and tells don that she was talking to the doctor. he knows it can’t be true since the doctor is dead, but then again, without the body, maybe he wasn’t dead after all and is still alive somewhere. the photographs cut in half and put into picture frames all over the house are a pretty cool twist. especially when one of them falls and don realizes what they are really of and why they are cut into half. that revelation makes him leave town, and unfortunately the movie doesn’t really supply him with a good reason for coming back. he leaves and goes back to his old job of mopping floors and then he gets another letter from sonny and comes right back to the house. there needed to be more incentive for him to return. But there are plenty of other good things about the movie. one is a promise that there is some mysterious back story there, about something terrible that don did and why he had to leave town. the movie wisely sets this up throughout, as don says things like that he can’t go to the police because of what happened all those years ago. it also wisely does not reveal what happened until the end. and by then, that discovery is actually part of something much bigger. it’s no longer just about don and what he did, but about who all of these characters really are and how don knows. while there are plenty of things to appreciate about this movie, there are also plenty of problems. the director is making his very first feature film, and he’s not exactly seasoned. so for example, he has don leave the town and go back to where he started way too many times. after a while, it seems like he is just repeating himself. don really shouldn’t have left town until the end. and the more times he does it, the less impact it has. a movie should never feel like it is repeating itself. And then the movie runs into some major problems for it’s ending. there is just one twist after another, all in a very small amount of time. it is too much to fathom and to make sense out of. and everything keeps switching back and forth at the blink of an eye. first, it’s a going and forth between who has an inheritance, then a going back and forth about who wants one character to kill another, and finally there’s the end twist which is actually two twists in one and really changes everything. it’s a cool twist, but by the time we get to it, our minds are exhausted from being tossed around so much. the first time i saw this movie, i really disliked it and that is primarily because of these end twists. they just lose you in what seems like silliness and stupidity. upon watching the movie a second time and knowing those twists were coming, it all makes a little more sense. the twists are meant to be humorous. the characters involved are absolute psychos, not really caring who dies so long as it isn’t them. the movie is much funnier upon a second viewing and that makes a world of difference. it still has it’s flaws, but the artistic attempts and humor manage to find their ways to the surface and the simplicity of the plot stands out as something pretty cool.